Saudi King Abdullah Leaves Behind A Complex Legacy : The Two-Way In the wake of the king's death, he is being remembered as a man who laid the foundation for reform, but also as someone who promised much but accomplished little. Saudi King Abdullah, seen here last November, died early Friday. NPR's Kelly McEvers says he was a man who laid the foundation for reform in the conservative Arab country. 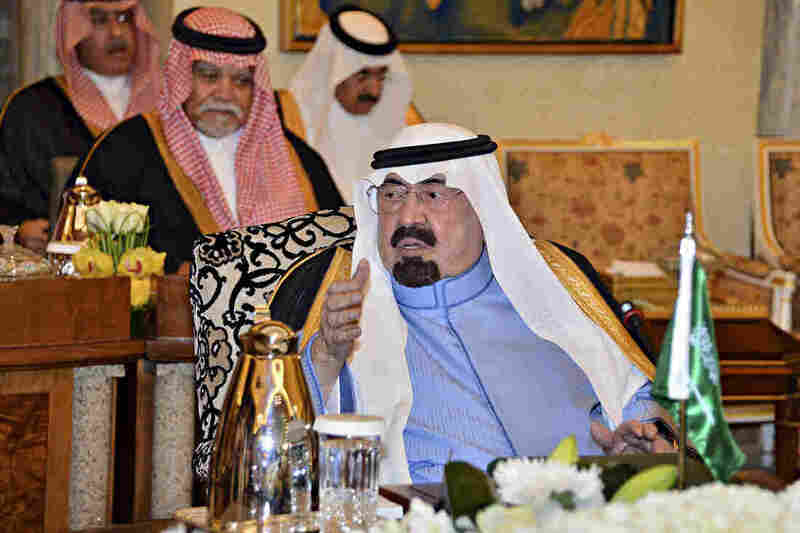 Saudis are mourning the passing of King Abdullah, who died early Friday at the age of 90 after a long illness. As NPR's Kelly McEvers reported, he is being remembered as a man who laid the foundation for reform in the conservative Arab country. Dignitaries from around the world, including Vice President Joe Biden, will gather today in Saudi Arabia for Abdullah's funeral. Several Arab countries have declared a day of mourning. It's important to note here why the Saudi king and his country are important: The king not only presides over vast oil reserves that have converted a backward area with tribal loyalties and tensions into a beyond-rich nation; he also is, according to his title, the custodian of Mecca and Medina, Islam's holiest sites. Abdullah, who became king in 2005, had effectively ruled Saudi Arabia since 1995, when his predecessor, King Fahd, suffered a stroke. During his reign, he drafted a plan for peace with Israel, cracked down on al-Qaida inside his country and weathered the Arab Spring that toppled long-entrenched leaders across the region. "Abdullah spoke as plainly as the Bedouin tribesmen with whom he had been sent to live in his youth. He refused to be called 'your majesty' and discouraged commoners from kissing his hand. He shocked the 7,000 or so Saudi princes and princesses by cutting their allowances. He was described as ascetic, or as ascetic as someone in the habit of renting out entire hotels could be." "It may be good to be king in a region where the Arab masses rejected their presidents. However, Abdullah will be remembered as someone who survived the wave of change, propped up by 'black gold', in his own kingdom by distributing largesse and repression and helped to reverse the prospect of democracy in the Arab world." "In the short term, the death of the king actually might ease strains in the relationship. The Saudi kingdom, as it enters a period of transition, may feel more vulnerable to external threats and eager to show the world that it still has the solid backing of the U.S. — the country the kingdom always has seen as its ultimate protector. "That in turn may reduce the Saudis' ability to move decisively on the difficult and contentious issues — toward Iran, Iraq and the Islamic State uprising, as well as oil policy — that the U.S. and Saudi Arabia have been trying to address together." Abdullah has been succeeded by Crown Prince Salman, his 79-year-old half-brother. Little is expected to change in Saudi Arabia. King Salman has already pledged to "continue adhering to the correct policies which Saudi Arabia has followed since its establishment." The Guardian notes that Salman, who is reported to be in poor health, isn't a reformer, but he has a "reputation for settling feuds within the large Saudi royal family." He is also known for his record of good governance during his nearly five-decade governorship of the capital, Riyadh. Oil prices soared after Abdullah's reported death, but analysts say the kingdom, which is the linchpin of the Organization of the Petroleum Exporting Countries, is unlikely to lower its production despite the plunge in oil prices.